You are a Leo if your birthday is between July 23rd and August 22nd. 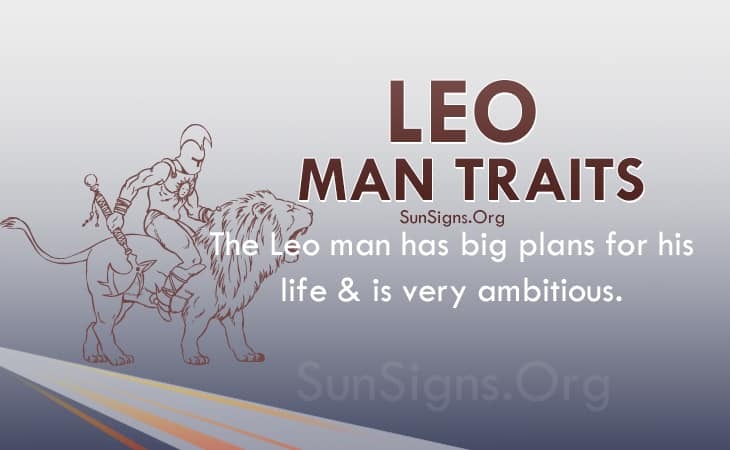 If there is one word that can describe a Leo man traits the best would be “ambitious”. The Leo man has big plans for his life, and he’ll do whatever it takes to accomplish them. The Leo man characteristics show that this male won’t let anyone boss him around; he aims to be the boss. This could cause for some trouble at work or in school with younger Leo men, but once the Leo man learns to control his defiant urge he can easily work his way to the top. The Leo man personality is not boring when it comes to making his way to the top. While his day-to-day life may seem routine to others, the Leo man will love working his way to the top. He may see it as more of a mission or an adventure, rather than daily office-work tasks. The Leo man will not be bored by this, but instead he will see each simple task at a stepping stone that will one day help him to advance in his job. The Leo man personality traits show that he is highly confident about his own abilities, which will help when it comes to his job, and even in social situations. The Leo man gives off a sort of air of pure confidence. Even if he is not sure of what he is supposed to be doing, he will make it look like he understands everything completely. This will impress bosses, friends, and even potential romantic partners. The Leo man characteristics show he is a sort of born leader. While he may not be the greatest at it at first, he will work towards it for his whole life. While the Leo man doesn’t mind working with his peers on a project, he would rather not have peers and instead have everyone listening to him. Obviously the Lion is not born in command, but he is confident in his abilities that he one day will be. The Leo man’s high confidence level will help to motivate his underlings, and this should help the Leo man to be promoted swiftly into a position of power. However, the Leo personality’s high confidence levels may make him seem vain and even sometimes narcissistic to others. The Leo man doesn’t mean to come off this way, but he doesn’t mind he comes off this way. He is proud of the way that he is, and if someone else doesn’t like it (so long as he or she is not his superior), then he won’t care. This could push away friends or romantic partners as well, because the other sun signs may not understand exactly what the Leo man is thinking. The Leo man traits show he may care if his long-time friends or romantic partner is bothered by it, but even if he does care, he is likely not to change much of his personality for other people. The Leo man characteristics also show he can be stubborn and stuck in his own ways at times. This could prevent him from seeing the big picture if part of it conflicts with his personal views. Leo men needs to learn to train themselves to avoiding seeing the world through their own bias so that they can get a better look of all the issues that surround them. If a Leo man stays obstinate for his whole life, then it is likely that he will not complete many of his goals. The Leo man falls in love often and deeply. He may think that he has found “the one”, only to have the relationship fizzle out, and then he’ll bounce right back once he finds another partner. The Leo man personality traits show he will want his romantic relationships to be exciting and competitive. Although, the Leo man will still want to be in control of the overall relationship. Fights can easily arise in this relationship if the Leo man’s partner does not understand his need to be dominant. This could be one reason why the Leo man usually has many small relationships before finally settling down with someone who truly loves and understands him. This was accurate for the most part. But yes, Leo Men can also be powerful, formidable, aggressive, courageous, and passionate.